Happy Monday! I can safely say "Happy Monday" without having office furniture hurled at me, because it's a short work week. Hallelujah for that. I envy those who have the entire week of Thanksgiving off, but hey. I'll take what I can get. This weekend was a lot of the same but some new too. 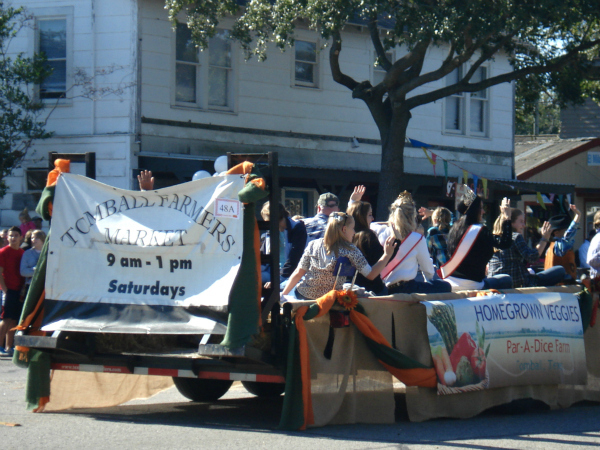 I wanted to get a few pictures of my farmer's market's float in the Tomball Holiday Parade on Saturday (because I manage the Facebook page, not because I have a weird obsession with the farmer's market). My parade experience is limited to Disneyland parades and watching the Macy's Thanksgiving Day Parade from the comfort of my couch, so I took advantage of the brisk morning and headed out to join the crowds on the sidewalk of Main Street. I got horrible photos because of the direct sunlight, but the event provided top-notch people-watching. The idea of a small town sounded really cute, and it was. Also, if you want to catch funny family moments, go to a parade! Sometimes, the parents are so much more embarrassing than the kids. The holiday cheer continued at home when Mr. TBS decided he wanted to swap our fall decorations for Christmas decorations. We plan on getting our Christmas tree this weekend, so he prepared the room. I'll tell ya. There is something magical about twinkling lights and candlelight! It makes the house so cozy. We quasi-hijacked Thanksgiving, but I'm not complaining. We're not sure what happened to Boone, but he is favoring his left leg. Watching him climb instead of jump is breaking my heart. He consoled himself by curling up in a bin and snuggling with Amelie. 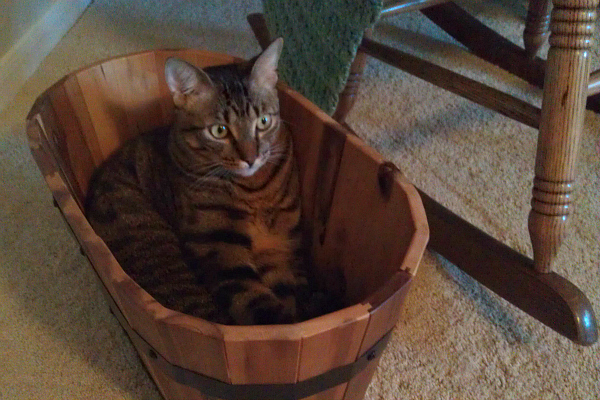 They have vet appointments next week, so we're hoping for some clarity if he's not fine by then. Throw in a Saturday evening bike ride, a Sunday morning walk with my love, watching every episode of "Nashville" on Hulu (I'm still judging myself), and homework, and you've got my weekend. I'm ready to plow through these three work days. That will be one more thing I'm thankful for on Thursday! Has anyone else quasi-hijacked Thanksgiving (other than Michelle)? We were at Lowe's yesterday to buy some herbs to grow, and Paul walked by the Christmas trees. He came out of the aisle and said "Well, I was going to say let's skip the tree this year since we'll probably be in Atlanta for Christmas itself and for the $$, but I just like the smell..." which I knew (neither of us are festive or big decorators, but the man does like himself a real Christmas tree) so I told him I figured we'd get one of the small, cheaper ones. He grinned- HUGELY. Poor Boone!! Keep me posted- you KNOW he'll be in our "doggy prayers" (it's an all-inclusive term in this house!!). That bin is beautiful Lindsay! I love hand crafted wood things. And am So Thankful for a 3 day work-week too!! Oh, and I home that the fur babies are feeling better!! You're one busy girl! The parade sounds fun and interesting. I feel like Christmas is being celebrated sooner than ever this year. I'm not sure how I feel about it yet. Happy Monday! sounds like quite the busy weekend! but nothing wrong with that! i'm a huge fan of bike rides..any weekend with bike rides is a winner for me! well, i hope that your short week hurries and ends so you can enjoy the holidays! happy thanksgiving! We are starting Nashville too (only 2 episodes so far) and then we heard the Hayden Panatierre song on an XM country station! Crazy! It sounds like a perfect country weekend and short work week! I've got the Thanksgiving decorations up for the big family gathering on Thanksgiving Day -- both sides of the family -- both extremely large in numbers! For the first time ever, I put up our Thanksgiving tree!! Happy Thanksgiving, Linz! And it's okay to get a jumpstart on Christmas because it's so beautiful! LOOOVE Nashville... total guilty pleasure but I don't really feel guilty about it. Glad you are catching up! Just found your blog :) Would love for you to check out mine! I need to get on that Nashville bandwagon. I'm sure my southern roots would appreciate it. It looks so good! Hahaha, I totally did highjack Thanksgiving :) I can't wait to get the tree up! That parade looks so adorable! I love small town parades. It's been so long since I've been to one. Poor kitty!! I hope Boone is feeling better soon!